Moveo / News / 2016 Recap! The Moveo Co. takes on a new turn, after a tour of nearly 40 presentations of Tu vas Tomber! In France, Portugal, Spain and Switzerland, to festivals such as the Mercè Street Arts Festival of Barcelona, the TAC of Valladolid, the Festival Mimos of Périgueux – France, where we gave a master class of physical theatre or the Festival Imaginarius of Santa Maria de Feira, where we received the Award Mais Imaginarius’16 for best company. ¡Congratulations to Jordi Font, Marta Hervás, Xavi Palomino, Adrià Viñas and Javier Cárcel! In 2017 we’ll premiere our next company production, with new members and the collaboration of the Festival Imaginarius of Portugal and the well-known Fira Tarrega. We’ll also have the pleasure the premiere a video of Tu vas Tomber!, filmed and edited by Edu Perez. During 2016 we’ve had the pleasure to welcome in residency the Co. Zero en Conducta and the Co. Mai Rojas y los Escultores del Aire. In June we finished another school year of our Diploma Programme in Corporal Mime and Physical Theatre with very good results. We presented in the Can Felipa Theatre the shows Lo que nos mueve, directed by Stéphane Lévy and Mai Rojas, and In-diferencias, directed by Sophie Kasser and Olivier Décriaud. The videos are available here! Members of our team gave workshops of physical theatre and corporal expression at the Palau Robert of Barcelona, secundary schools of Argentona and Gava, and for AIXEC in collaboration with the association Perpetuum Mobile. For the third year, we collaborated with the Jove Cia Teatre de l’Abast of Valencia. We also received the visit of the US company MB Adaptors, and her director Kari Margolis, and we collaborated with the Circus School Rogelio Rivel. On 3rd of October we started a new school year of our Diploma Programme with students from 15 different countries. We continue working proudly with the teachers Olivier Décriaud, Mai Rojas, Pere Farran, Montse Bonet and Cecilia Colacrai. We are glad to share with you a new video clip, where we present the Dance Class of the Diploma Programme. The videos of the other subjects will be available soon! Big novelty of 2016: we have new web pages!! www.moveo.cat for the Centre and www.ciamoveo.cat for the Company. We are still on Facebook: Moveo Centro de Formación y Creación and Twitter: @moveo_barcelona, and we have premiered new Moveo t-shirts, with a wonderful design by Laura Valero and available to buy online. We welcome Gemma Ruiz, who realises an internship for her degree in Communication for Cultural Industries, University of Barcelona at our centre. Estella Muñiz continues being our great coordinator and head of Communication. A big thank you to both of them! 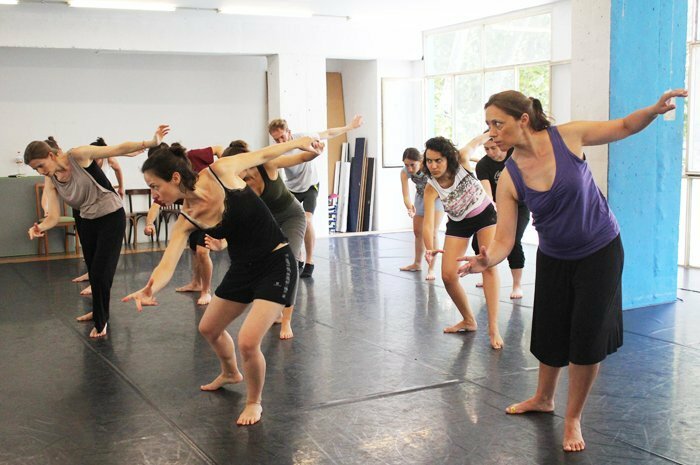 As you can see, the Moveo centre keeps busy, with rehearsals, courses and other activities, as well as the enthusiasm and the desire to make the art of movement a way for artistic creation and performance. To everyone, all over the world, we wish you a happy 2017!